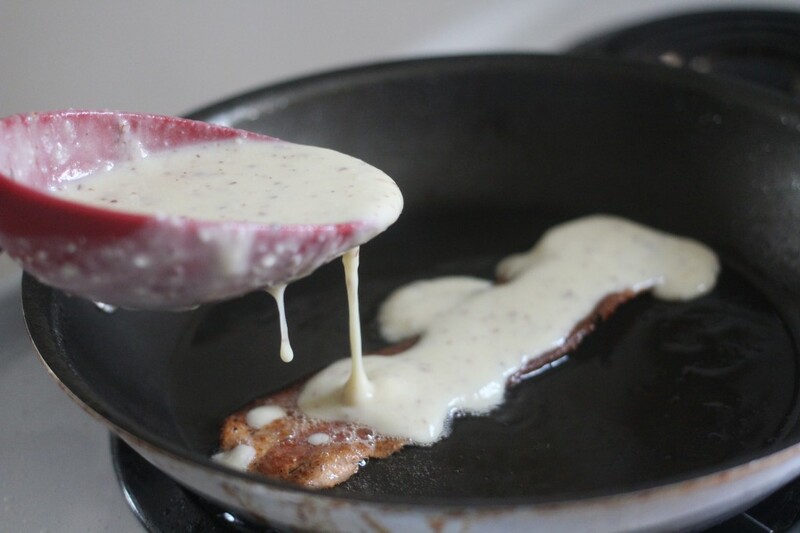 Bacon Pancake Recipe - Frugal Mom Eh!
. We don’t eat pork in my household so I used Turkey bacon but this of course will work just fine with regular old pork bacon. A stack of these bad boys would probably make for the best father’s day surprise ever. Feel free to use your own favourite pancake recipe or mix. I’ve included my pancake recipe for anyone who wants to do this from scratch. 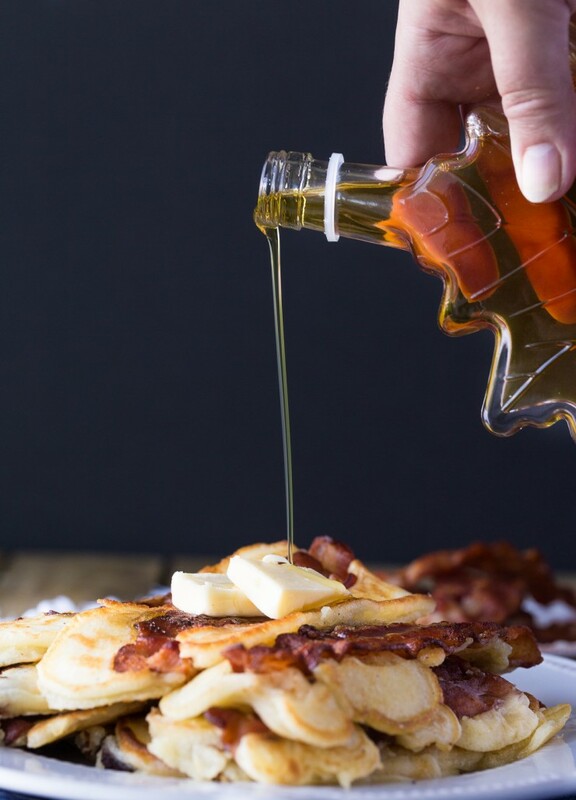 You should be able to get about a dozen bacon pancakes from this recipe. Fry Bacon in a pan to desired level of crispyness. Pat grease off the bacon and set aside. Meanwhile, In a large bowl, sift together the flour, baking powder, and sugar. Make a well in the centre and pour in the milk, egg and butter; mix until smooth. Add a couple pieces of Bacon back to your pan, over medium-high heat. Poor a couple tablespoons full of batter over bacon, following the shape of the bacon. Brown on both sides and serve hot with Maple Syrup. Pat grease of the bacon and set aside. 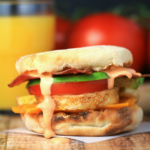 Love breakfast recipes? Check out Panettone Waffles from my friend Kerrie @ Family Food and Travel! This recipe for Banana Pancakes was originally published in April, 2014. Oh my, I know the men in my house would love this. 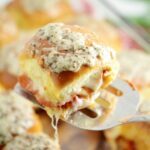 mmmm I’ve never tried this actually but looks like a fabulous Sunday breakfast idea! My guys would go nuts for these! Definitely gonna do it over the weekend! I guarantee they will never let me make pancakes plain again lol. This is incredible! I have never thought about making Bacon Pancakes like this! I have to make this recipe! 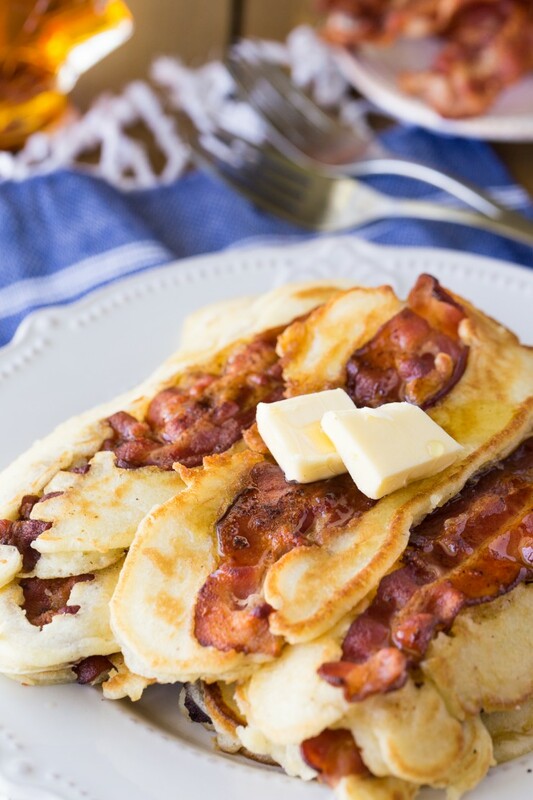 This looks so delicious and we all love bacon with pancakes! This is something my father would like. Initially I thought this would be greasy and gross, but hubby convinced my to try making it, and you know what….it’s not gross. It’s good!!! especially with real maple syrup on it. I’m glad you enjoyed it Debbie! oh my goodness! your recipes are so amazing! this looks so yummy and I’m going to have to make it for sure! delicious! What a great idea! I have to try this recipe! Oh wow, my family would LOVE this! I remembered these this morning, mentioned it to my son. Looks like it’s breakfast for dinner tonight! 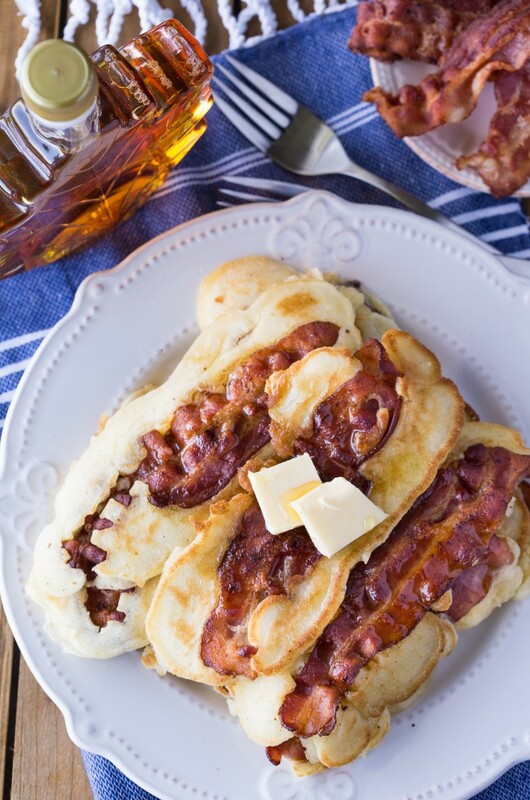 These bacon pancakes would be a BIG hit at my house 🙂 I would love for you to share this on my Friday T.G.I.F. linky party 🙂 Have a great weekend!! My husband would go nuts for these! Thank you for sharing! These sound GREAT!!! I always enjoy the salty taste of bacon w/ the sweet taste of pancakes anyway….putting them together works………and my family would love it. 🙂 Thank you for posting this. We just had bacon and pancakes for Easter brunch – bacon pancakes would have been a perfect alternative! We’ll have to try them next time (I’ve pinned it). Thanks for the recipe. This would go over so well in our house, we love bacon and we love pancakes, and having them both together, divine!! I think my daughter would go nuts over these. She had pancakes this morning and was so excited, add in the bacon and I think she would have a hard time containing herself. 🙂 Thanks for sharing. Wow, that is such a great idea!! I am drooling right now! Can’t wait to make this on the weekend! 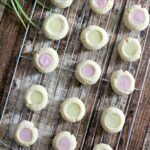 This is by far one of the best recipes I have seen and it is SO easy! I am making this tomorrow morning!! I don’t eat pork either, so I would use turkey bacon and I would love to try this very interesting recipe.. So it’s pancakes with bacon inside, can’t wait to try it. Thank you for sharing this recipe. 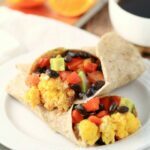 My favourite breakfast foods all rolled into one! 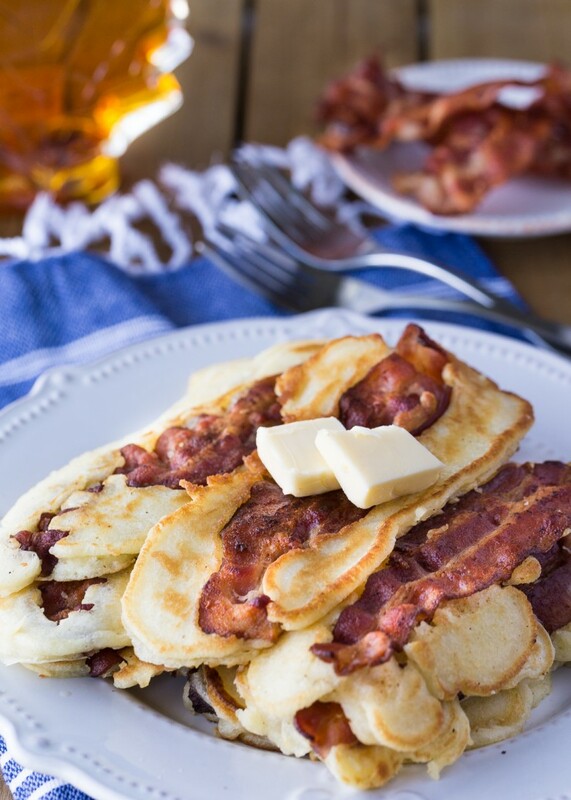 I plan on making these bacon pancakes soon-maybe tomorrow morning. The bacon would be crisp so would not add too many fat calories. It would also be a tasty surprise to whoever was eating the pancakes. I like this idea very much, I wonder if you could freeze them then pop them in the toaster when you wanted a quick snack ? I have never tried these but I bet they are so splendidly delicious with maple syrup.What a great idea! 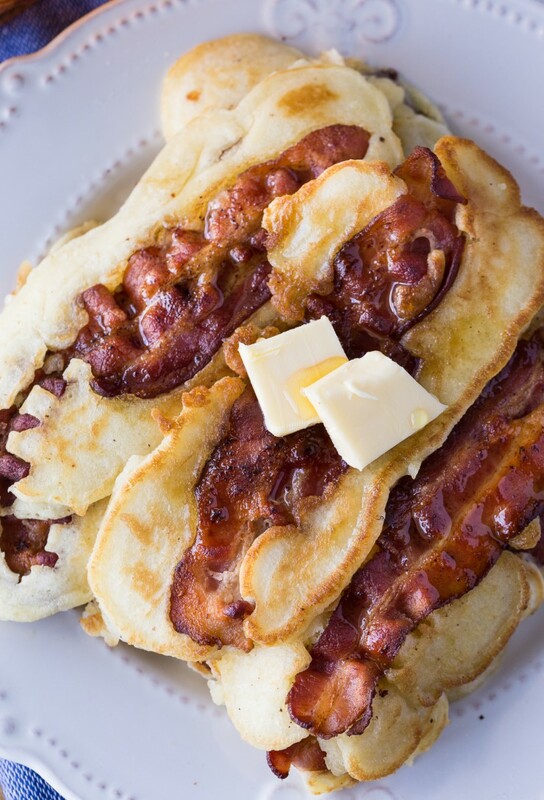 My husband would absolutely love these bacon pancakes. In fact, I would love them as well. As soon as I get bacon, I will be enjoying them with him. Thank you for the idea. My guys are going to love this!! Sunday brunches will never be the same again.